Natani: …and then they just started leaving. I have no idea why, but it seems like they’re letting us go now. Zen: Say, isn’t that your boyfriend out there? Zen: Seems like he’s leaving too. Natani: Zen, if you use that word one more time I-! Hey! Where’s he going?! Natani: Keith, wait! What’s going on? Keith: I don’t have time to explain! Just get to the ship. I have to go! 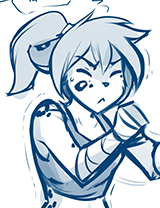 Natani: But my… I can’t! the others would… Arg! Get back here! Natani: Sigh… what do I do now? Zen: Woah! Hey, Nat, who’s the huge Basitin lady? Natani: That’s probably the “King” I mentioned earlier. Didn’t expect him to be a woman, eh? King Adelaide: To be fair, I didn’t expect it from you, either.